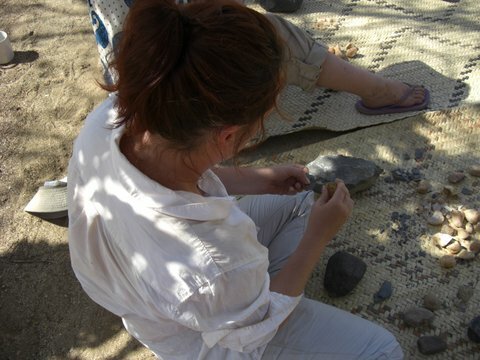 We are almost at the end of the archaeology module, and thus at the end of the Fall 2014 Field School. Ten weeks have flown by! 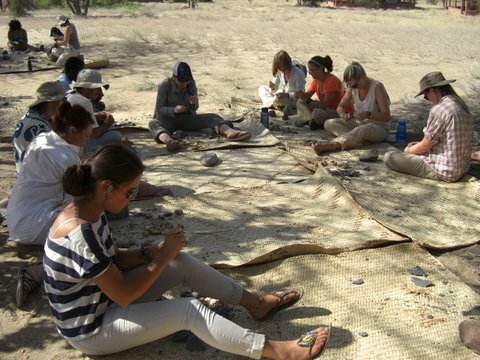 This week, students got to try their hand at knapping stone tools, a much-anticipated activity. 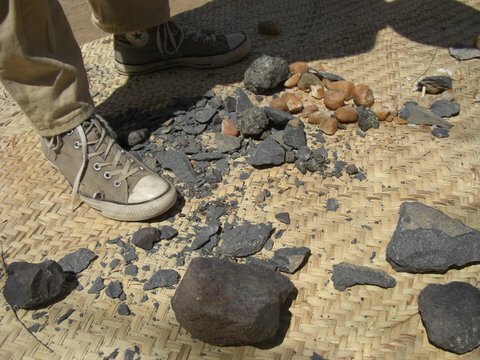 Dr. Harmand accompanied students on a trip to collect raw materials, in this case quartz hammerstones and cores. 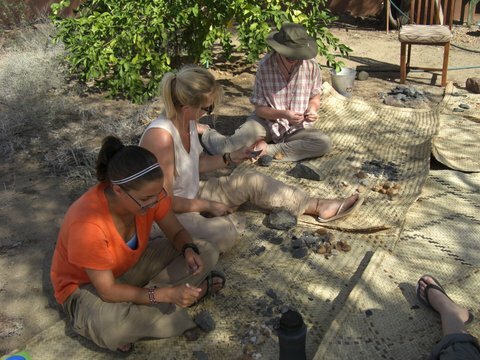 After a short walk outside the compound, everyone had plenty of quartz to work with, and we got knapping. 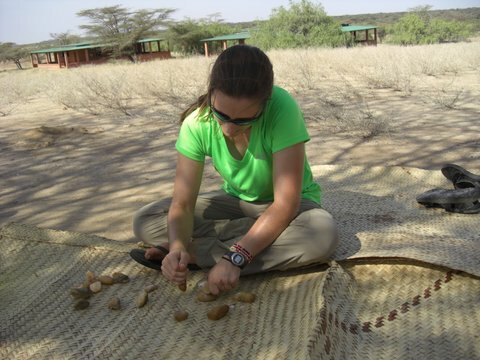 Maggie displays an abundance of natural knapping talent. Quartz is quite difficult to knap, especially the smaller rocks and pebbles that the students were using, but persistence paid off and most were able to produce some flakes. Following the basic rules Dr. Harmand laid out in lecture was a huge help. Katie beams with well-deserved pride as she shows off her flake. 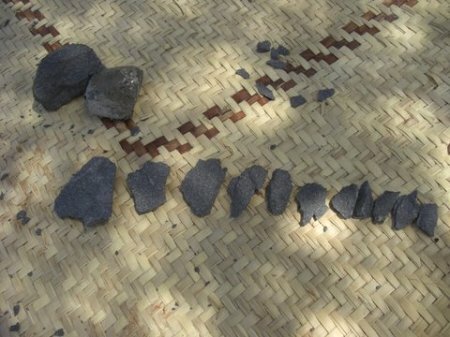 The next day, puffed up with confidence, students moved on to knapping phonolite, a slightly easier material than quartz. Cognitively complex hominins at work. Trisha, Katie, and Eloise concentrate in order to produce functional flakes. Some students focused only on removing flakes from their core, but others were more ambitious. 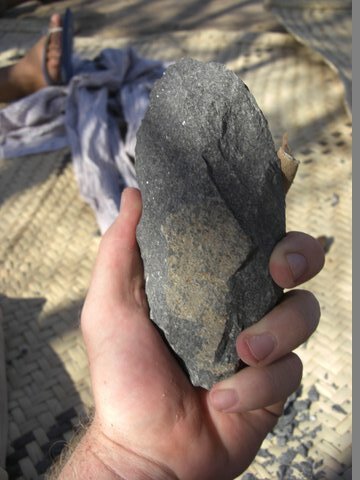 Ned impressed everyone with his attempt at a handaxe; the finished product was quite the sight! Flakes with core and hammerstone above. 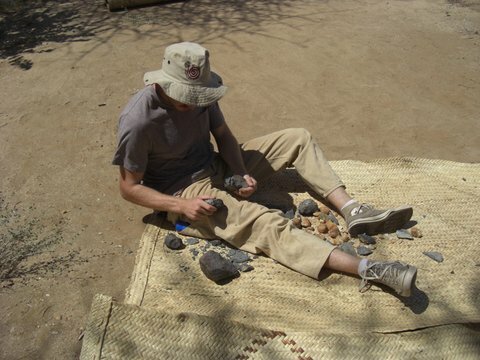 Ned knaps away at his handaxe. Once students removed flakes from their core, they retouched the edges (carefully removed very tiny flakes with a small hammerstone) to make them extra sharp. Megan got extra creative and added some rock art to her flakes. Letty expertly retouches her flake. 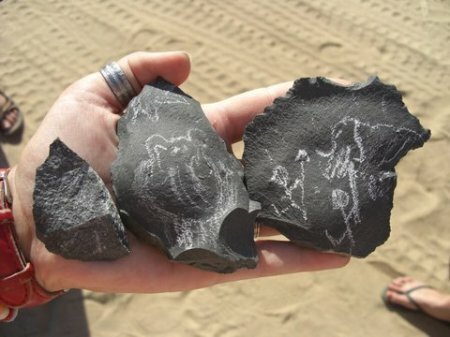 Rock art, a sure sign of Megan’s behavioral modernity. Once everyone had two or three sharp flakes, we used them to skin two goats with the help of the TBI staff. The goat roast is a TBI Field School tradition and allows students to use their stone tools like an ancient hominin would have. The goats were roasted and then students and faculty enjoyed a delicious barbecue in the evening. 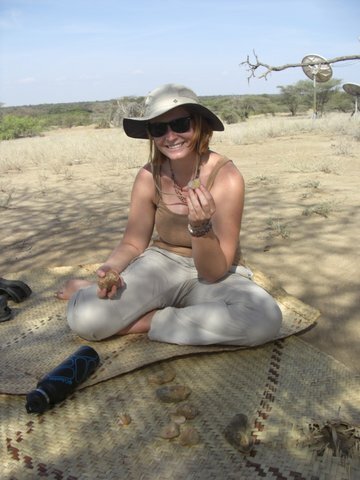 By Abigale Koppa|2017-01-04T18:04:51-07:00November 14th, 2014|Field Schools|Comments Off on Knapping!